uPub™ is the powerful online authoring system that proves it’s easy to design, develop, manage, and distribute valuable content. The promise of digital publishing has been elusive: projects are expensive, author training is arduous, and existing systems are inflexible and costly to alter. uPub eliminates these obstacles. uPub is easy for the authors of our POC-IT Guides, yet provides powerful features for creating rich, digital content. Working in uPub is a new and refreshing means of writing and editing. It is clearly the wave of the future in publishing. We selected uPub to develop our comprehensive print and online Textbook based on earlier successes using this unique system. For many years new interns have received a book about required rotations, patient care, the local environment. With uPub, helpful guidelines can be updated and carried in a pocket. 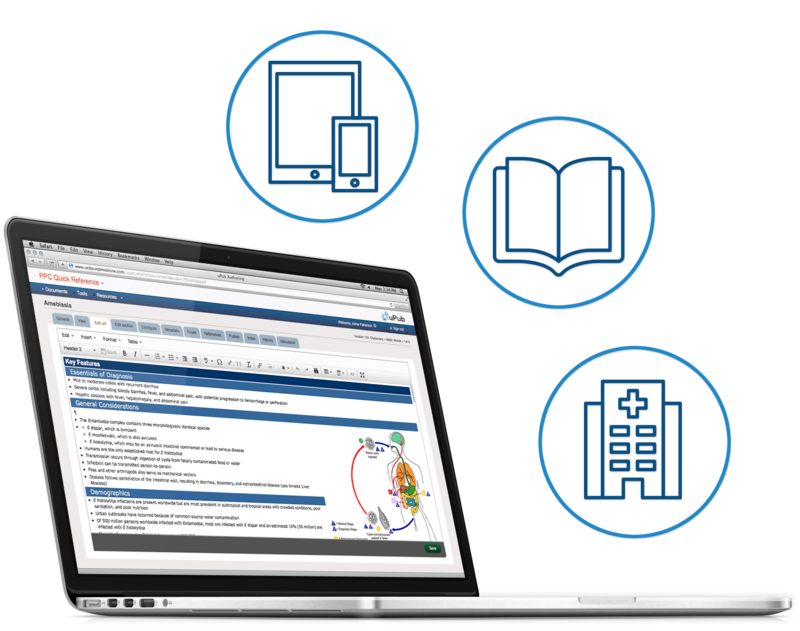 uPub’s intuitive interface makes publication to the web and mobile apps easy—curricula, handbooks, guidelines, and more. And Unbound enriches your content through integration with trusted references.